For a limited time, Autodesk customers who purchase a 1, 2 or 3 year subscription at full price are eligible to purchase an additional new subscription of the same or lower value product at up to 30% off. 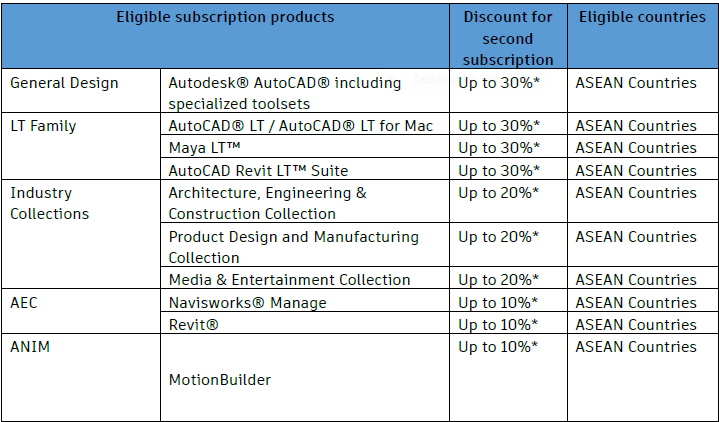 For users who need to access multiple toolsets across more than one product an Autodesk Industry Collection provides greater value than buying the individual products separately, and for a limited time save up to 20% on the second NEW seat when for subscriptions to the Architecture Engineering and Construction Collection, Media and Entertainment Collection and Product Design and Manufacturing Collection. Plus, both new Autodesk customers and existing customers (who are ready to renew) can save up to 30% off the second NEW seat across the One AutoCAD or AutoCAD LT.
For a limited time, if you purchase a new or renew subscription at full price, you are eligible to purchase an additional new subscription of the same or lower value product at up to 30% off. Terms and conditions apply. Please see below. 1. What is the FY19 Q3 Autodesk Better Together: Save up to 30% for second subscriptions offer? Customers who subscribe to a new subscription of any of the eligible products for 12 months or more between August 7, 2018 and October 19, 2018 (dates inclusive) can add a further new subscription of the same or lesser value product at a promotional discount of up to 30% off the SRP. The promotional discount applies to new purchases only. Please refer to Table 1 for a list of eligible products. Existing customers who renew a subscription contract of any of the eligible products between August 7, 2018 and October 19, 2018 (dates inclusive) can add a further new subscription of the same or lesser value product at a promotional discount of up to 30% off the SRP. Customers need to renew all expiring subscriptions within the same contract before purchasing the promotional discounted new subscription. The promotional discount applies to new purchases only. Please refer to Table 1 for a list of eligible products. • The additional discounted subscription must be purchased at the same time as the new subscription, however is not required to have the same Autodesk Order Number. • The additional discounted subscription must be for the same or a lesser value product, and will be co-termed with the qualifying subscription. • All standard renewal policies apply as found in Section 2.6 in the Program and Policy Guide. 2. Where can customers learn more about subscriber benefits? Customers can go to www.autodesk.com/subscription.com for more information about subscriber benefits. 4. What products are eligible for the discount? The second subscription of the following products are eligible for the promotional discount when purchased at the same time of a new or renewal of the following products. Please refer to Table 1 detailed list of eligible products. 5. Is this offer available through Autodesk eStores? No, this offer is not available through Autodesk eStores. Customers are eligible to purchase one additional annual subscription of any of the products from the list in Table 1 at the discounted price for each new or renew subscription purchased. There are no maximum limitations. 7. Are the discounts available for both subscription with single-user access and multi-user access? Yes. Discounts are available for single-user and multi-user for ASEAN Countries. 8. Are the discounts available for annual and multi-year subscription? Yes. Discounts are available for annual and multi-year subscription. 9. Are the discounts available to maintenance and subscription plan renewals? The offer is only applicable to subscription plan renewals. Maintenance plan renewals are not eligible to this offer. 10. What happens if a customer is renewing a subscription contract within 90 day standard renewal window? If a customer renews a subscription prior to the expiration date (up to 90 days per standard renewal window), the customer will receive the promotional discount for the entire term up to 15 months. ▪ A customer with an AutoCAD LT subscription expiration date of November 1, 2018 elects to renew on October 1, 2018 (within the 90 day window). They want to add an additional subscription of AutoCAD LT per the current offer. The customer will receive the promotional discount for 13 months (October 1, 2018 – November 1, 2019) for their new additional subscription. 11. Can the offer be combined with any other offers? No. The offers may not be combined with any other discounts, promotions, or other incentives offered by Autodesk unless specified. 12. Are Named Accounts eligible to participate in this offer? Discounts offered by Autodesk under this offer cannot be combined with any discounts provided by Autodesk to contracted accounts according to any relevant agreements. Examples: Accounts with EBAs (Enterprise Business Agreements) and ETRs (Extra Territory Rights) are not eligible. Named Accounts may choose to select either the contracted discount OR the promotional discount, but not both. 13. When is the last day a customer can purchase with this offer? October 19, 2018 is the last day for customers to purchase with this offer. TIME WITHOUT NOTICE, FOR ANY REASON IN ITS SOLE DISCRETION. PRICES FOR AUTODESK SOFTWARE ARE SUBJECT TO CHANGE AND MAY VARY BY COUNTRY. Advertised discounts and savings are based on SRP. SRP is Autodesk’s suggested retail price (excluding freight, handling and taxes) for the specified product in your region. SRP is used for reference purposes only and may not be in local currency. Actual retail price is determined by your reseller, and is subject to currency fluctuation. Offer subject to reseller participation. Channel partners are independent and free to set their own prices. Reseller prices may vary. Autodesk, the Autodesk logo and Autodesk®, AutoCAD®, are registered trademarks or trademarks of Autodesk, Inc., and/or its subsidiaries and/or affiliates in the USA and/or other countries. All other brand names, product names, or trademarks belong to their respective holders. Autodesk reserves the right to alter product and services offerings, and specifications and pricing at any time without notice, and is not responsible for typographical or graphical errors that may appear in this document. ← Special Offer: Get a 3-Years Subscription for Half Off!